Topic: BRC WEEKLY newspaper seeks pre-playa submissions! BRC WEEKLY newspaper seeks pre-playa submissions! 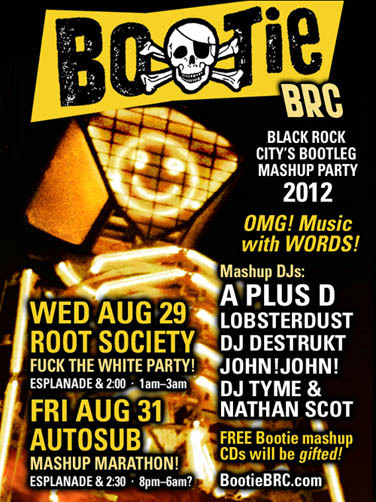 Topic: BOOTIE BRC mashup parties: OMG! MUSIC WITH WORDS! Re: BOOTIE BRC mashup parties: OMG! MUSIC WITH WORDS! 600 Bootie mashup CDs burned, and ready for "gifting," we're ready to party! See you out there, Black Rock City! Death Guild Thunderdome plays goth/industrial every night for the fights. Bootie is just doing a special goth/industrial MASHUP set on Tuesday. Topic: Bootie BRC: OMG, Music with Words! Re: Bootie BRC: OMG, Music with Words! Bootie BRC: OMG, Music with Words! Re: BRC WEEKLY newspaper seeks pre-playa submissions! Topic: Deadline for submissions to the BRC Weekly! Deadline for submissions to the BRC Weekly! Since the JRS hasn't published our last 2 submissions for articles we'll keep asking for more on here. We're needy that way. Topic: Didn't get the BRC Weekly on the playa? Didn't get the BRC Weekly on the playa? You can get the whole issue in PDF format at our BRC Weekly website!